Features 11 points of articulation and includes an alternative bass guitar with strap and a removable red fabric cape. Entertainment Earth Convention Exclusive! Bring The Demon to life right before your eyes with our KISS Dynasty The Demon Bloody Variant 3 3/4-Inch Action Figure from Bif Bang Pow!. Celebrating the band's Dynasty Tour attire, this The Demon action figure varies from the main version by depicting the rocker with a bloody face. 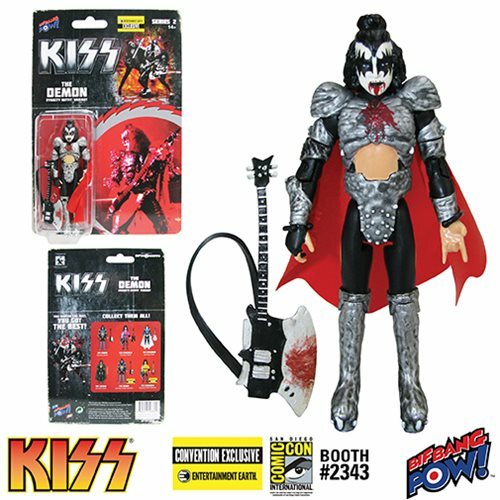 Featuring 11 points of articulation (neck, shoulders, biceps, elbows, hips, and knees), this bloody variant action figures includes a bass guitar with strap and a removable red fabric cape. This authentically detailed KISS Dynasty The Demon Bloody Variant 3 3/4-Inch Action Figure is crafted from plastic on a 3 3/4-inch scale. Plus limited to only 504 pieces, each Entertainment Earth Exclusive action figure is individually numbered with a holographic sticker. Order yours today, and party with one of rock's most iconic musicians in your own home. Order yours today, and party with one of rock's most iconic musicians in your own home. Prototyping by 3D Systems a.k.a. Gentle Giant. Ages 14 and up.